"Great tasting apple pie in a jar but it does pack quite a kick if your not careful. The longer it sits in the fridge the better it seems to get. Makes a great gift." Combine apple juice, apple cider, white sugar, brown sugar, and cinnamon sticks in a large pot; bring to almost a boil. Cover pot with a lid, reduce heat, and simmer for about 1 hour. Remove pot from heat and cool completely. Stir grain alcohol and vodka into syrup and remove cinnamon sticks. 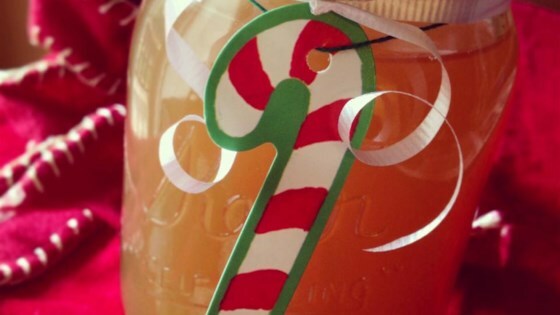 Pour apple pie moonshine into clean glass jars or bottles. Store in the refrigerator. Keep the party indoors with this all-American homebrew, ripe with boozy flavor! Try putting a cinnamon stick in each container if you like a lot of cinnamon. I like to keep the apple juice and cider jugs to put the finished product into for storage. Also use wine bottles or the liquor bottles as well. I made this recently.......definitely not enough alcohol, and I recommend, less cinnamon. Not like grandmas moonshine, but it's not bad. Easy to prepare. And you can get 190 proof in CA, only on military bases though. I make this twice a year, follow the same recipe but i add 1 bottle vanilla vodka, 1 bottle caramel vodka, 1 bottle fireball and 1 bottle butterschnapps. I cut the white sugar in half. Much better!